All of these items are also available at The Grand Cinema Box Office. If you are purchasing something as a gift and would like the item(s) mailed to an address other than your billing address, please email us with the details. Our stock is always changing. If we are out of stock in a certain size or color, we will contact you with alternatives. HOLIDAY 2018: Please note that we cannot guarantee delivery by Christmas for any purchases made after Wednesday, December 19th. Our administrative office is closed from December 22nd-December 25th. Available in green, red, purple, black. Sizes small-XXL. Available in greed or red. Sizes small-XXL. Available navy with green logo, sizes small-XXL in either short or long sleeve. A remix of one of our most beloved designs. Available in sapphire blue or pink, sizes small-XXL. Our classic Red Dot design is back - now with two style options: Unisex and Women's! A brand new addition to the Grand Cinema t-shirt family. Perfect for the collector in your life. Available in charcoal gray and sky blue, sizes small-XXL. Get weird at The Grand Cinema! The new Weird Elephant series features the bizarre, spine-chilling, fantastic, or just plain mind-blowing - and now it has its own shirt! Available in charcoal gray with black elephant design and in black with red design, sizes small-XXL. Original screen print signed by the artist, Jeremy Gregory/Candy Teeth Creative. Available in black. Sizes small-XXL. This cozy zip-up hoodie is a NW essential. Available in military green, sizes small-XXL. 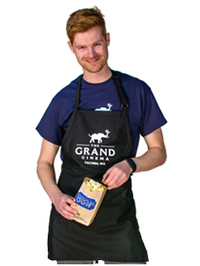 Our aprons are perfect for cooking dinner or serving popcorn at The Grand Cinema. One of our all-time favorite items. Black with white logo, one size fits all. Show your TFF pride all year long! Good for admission, merchandise, and concessions costs at The Grand Cinema. Sold in $5.00 increments. When purchasing online, Movie Money will be mailed to the specified postal address. Please allow up to a week for delivery. Order quantities are selected during checkout after selecting "add to cart". Good for one admission to any regularly scheduled movie at The Grand Cinema. When purchasing online, Admit One Passes will be mailed to the specified postal address. Please allow up to a week for delivery.